When the cut-glass enthusiast correctly identifies a pattern on an item he owns, he feels a sense of satisfaction. This happens, at least in part, because he has taken the first step in getting to “know” his cut glass. Additional steps can help the enthusiast to accumulate information that will add to the enjoyment of his own particular piece of cut glass and of cut glass in general. In addition to the name of the company that cut the pattern, this information can provide leads to the name of the company that made the blank that was used. Craftsmen — including designers, cutters, and engravers — may also be identified as further steps are taken. More importantly, the enthusiast’s piece of cut glass is no longer seen in isolation. It reflects something about the artistic, commercial, and social conditions prevailing at the time it was made. This can result in an acknowledgment by the enthusiast of influences — both domestic and foreign — that helped determine not only the pattern but also the shape of the item, its use, and its place in the social fabric of the day. But before the enthusiast can arrive at this point, there is that first step to be taken: the correct identification of the pattern. During the 1950s and early 1960s it was a common experience to read that the general problem of pattern identification probably did not have a solution; there were just too many cut-glass patterns, or so claimed writers at that time. Few patterns were named and those that were identified often carried assigned, or “coined,” names in place of the names given to them by their manufacturers. Dealers and collectors seized upon both official and assigned names and applied them, often indiscriminately, to unknown patterns, calling them “this-or-that variation.” For example, in the case of the “Middlesex” pattern, itself a misnomer, the variation game reached such a pitch that one could find similarly named products from at least four different companies. Today, it is recognized that there is no “Middlesex” pattern; this pattern and its variations, so-called, have all been correctly identified; but it took decades for this to happen. The enthusiast is a patient individual! The beginning collector may well feel that it is still true that there are “too many patterns” to identify. 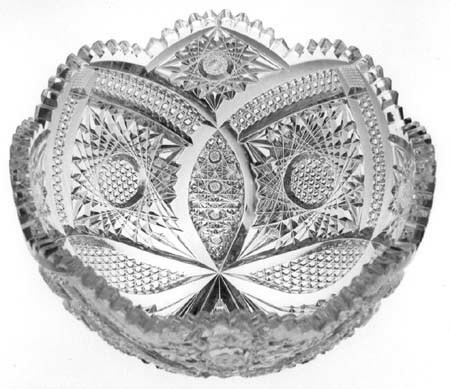 Fortunately, the following two facilitators can ease his task: (1) J. Michael Pearson, in his ENCYCLOPEDIA OF AMERICAN CUT AND ENGRAVED GLASS, has categorized many patterns through use of a rational scheme that often permits rapid identification; and (2) Catalogs are now readily available for many companies. In addition to pattern names, they usually provide shape (blank) numbers, and they often list contemporary prices as well. J. Michael Pearson’s ENCYCLOPEDIA, privately printed, 1975 to 1978, was preceeded by two books co-authored with his wife, Dorothy T. Pearson: AMERICAN CUT GLASS FOR THE DISCRIMINATING COLLECTOR (1965) and A STUDY OF AMERICAN CUT GLASS COLLECTIONS (1969). These books provide much of the material contained in the ENCYCLOPEDIA, which is a ten-year update, and they also include some information that is not available in the ENCYCLOPEDIA. While the pre-ENCYCLOPEDIA books are useful, the ENCYCLOPEDIA has a higher priority from the viewpoint of pattern identification. All of these books are out-of-print, but copies for sale appear from time-to-time on the Internet (note 1). The first and third volumes of the ENCYCLOPEDIA contain geometric (cut) patterns. The second volume, of realistic patterns, is devoted to patterns that are partly or entirely engraved with flowers, fruit, etc. The first volume focuses on geometric conceptions by which is meant the outline made by the major miter cuts. This outline often takes the form of a distinctive geometric design, especially in patterns of the Brilliant Period. For example, all patterns that have an over-all outline of “crossed bars” are grouped together; other categories include “crossed ellipticals,” “chain of hobstars,” various “vesica” outlines, etc. The example on the right shows a “cross-cut vesica.” (The simplest vesica — one that is not cross-cut with an additional pair of miter cuts — results from two overlapping, miter-cut circles. Such a design has its origin in antiquity. A vesica was often used in the Middle Ages to surround religious figures in paintings and other art work.) Motifs that are often dominating, such as “notched prism flairs,” are also included in volume one and are grouped separately. While a great many patterns can be classified under one of the geometric conceptions in volume one, many can not. Therefore, Pearson arranged these patterns based on their geometric motifs, in volume three. It is assumed that the reader has a basic knowledge of cut-glass motifs, but, because all of the motifs are illustrated repeatedly, it is an easy matter for the reader to recognize any motif with which he may not be familiar. The motifs are arranged alphabetically within each group. For example, all patterns that contain the motifs of “beading, hobstar, star, and strawberry diamond” form one group. There is some overlap between volumes one and three, so both should be consulted when seeking to identify a geometric pattern. The realistic patterns in volume two are simply grouped under the appropriate name of the flower, fruit, etc. that is illustrated. Examples include “wild rose,” “urn and vase combinations,” “daisy-type patterns,” etc. Volume three also contains a geometric-conceptions supplement, a supplement for the realistic patterns of volume two, and a cumulative index for all three volumes. In addition, there is a “relative value guide” that rates 234 specific patterns, both geometric and realistic, as of 1978, the year of publication. The Pearson ENCYCLOPEDIA is now more than twenty years old. Ideally, the volumes should be completely revised in order to add recently-discovered material. But, for the time being, only “additional pattern identifications,” for previously unidentified, or incorectly identified, patterns are available for the three volumes. The writer has not heard of any plan to digitize the ENCYCLOPEDIA and make this database available on the Internet. Copyright protection probably is the reason. If the cut-glass item under investigation is signed with an acid-etched trademark then its manufacturer is readily identified, and an extant company catalog is a possibility. More than a score of these catalogs have been reprinted over the years, mostly by the American Cut Glass Association. Contact the association at acgakathy@aol.com for a list of catalogs currently in print. These catalogs, together with references to catalog pages that are found in other publications, are included in the discussions of individual companies that are found in ‘Cutting Houses‘. Dealers and collectors usually keep detailed records of their acquisitions. The writer has found it useful to follow Pearson’s scheme when describing a pattern. In the example shown here the pattern is unknown. A 4″ x 6″ file card provides adequate space for an analog record. Some collectors attach a photo to the card; others keep a separate file, analog and/or digital. Photos are identified by the object’s item number. Weights are easily measured with an inexpensive kitchen (food) scale. PRO: The main advantage of a card system is its flexibility. Cards are easily filed and moved about, for example from “inventory” to “year sold. . Entries are easily updated. CON: The main disadvantage of a card system is that it is all too easy to misfile a card. But we have not lost one in 20 years! D = 8″ (20.3 cm), H = 3.75″ (9.5 cm), wt = 3.5 lb (1.6 kg). Sold for $150 in 1991. Condition: Describe all damage. Any prior repairs? Restoration: Necessary? If so, describe briefly, and note cost, date, and name of restorer. References: Catalog reference. If pattern/manufacturer is unknown, note possibilities (A. L. Blackmer in this case). Pattern/shape seen elsewhere? Publication? Internet? Price expected: (if to be sold); otherwise, use an evaluation. Price paid: Seller’s name, address, venue, date. Corners of card can be used for “flag” information: e.g., ITEM NO., PHOTO (if available), SOLD, etc. Information regarding disposal of item: If sold, register buyer’s name, address, price paid, and date. Log all expenses: Purchase price, restoration cost, sale expenses, shipping, etc. Do the arithmatic and obtain your profit/loss. 1. The five cut-glass books by Bill and Louise Boggess (1977-2001), which are widely available, are not considered authoritative by most dealers and collectors. They must be used with caution. Typically, material is poorly organized, photography is of variable quality, and — most seriously — pattern identifications are frequently incorrect. The texts also contain numerous errors. If the reader plans to use any of these books, it is recommended that he visit The Boggess Project file beforehand.